WATCH: How To Make Your Darker Spots On Your Skin Lighter and Beautiful? Many of us are dreaming of a healthy and beautiful skin. But because of some factors that makes our skin dull and unhealthy, we always look for the best for our skin. One of the major skin problems is the discoloration of the skin. People usually buy beauty products that are so expensive, yet didn't know the side effects that can cause them a problem. And not all of these expensive and beautiful products are effective. Why do you need to spend thousands of dollars to have a beautiful skin, when you can find it in your kitchen. Put yogurt on your hands and legs before going to the beach. Leave it for 5-7 minutes, then wash with lukewarm water. The yogurt has a natural chemical called lactic acid that brightens the skin. You need to grind the orange peel, then mix the milk until it becomes a paste. 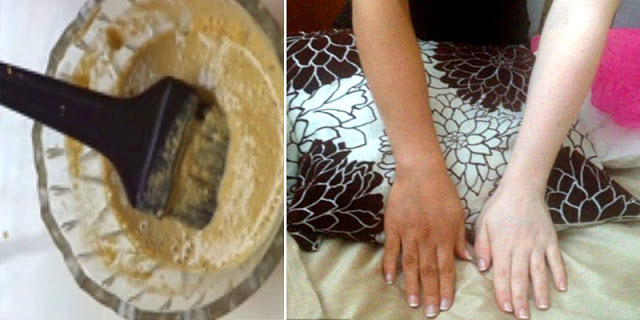 Apply this mixture to your hands and legs and leave it for 20 minutes for best results. Oranges are rich in vitamin C that naturally lightens your skin. Mix the juice of the lemon with baking soda and put it in your hands and legs. Leave it for 20 minutes and rinse. Do it for 15 days and you will see the improvement in your skin. Lemon has a natural antioxidants that encourage new cell growth in your skin. Just simply apply the gel of the aloe Vera on your hands and feet. Leave it for at least 30 minutes and wash it off. Aloe Vera has an anthraquinone that helps color of the skin lighter. Mix the buttermilk and tomatoes until it becomes a paste and apply it on your hands and feet using a cotton ball. Leave this for 40 minutes. Wash it thoroughly. Both ingredients have a natural whitening properties. You need to slice the potato and rub it to the darker part of your body. Leave the moisture on your skin for 10 minutes and rinse with water. Potato juice has an effective properties in lightening your skin. Make a paste using the gram flour and honey. Apply it to your hands and legs. Leave it for 30 minutes and wash it off with water. Do it at least twice a week. Gram flour makes your skin brighter and lighter.